The Army has fought in eleven wars and conducted 190 campaigns over more than 240 years. Those hard-fought honors are represented by campaign streamers attached to the Army flag as a reminder of the selfless service and courage of the more than 30 million men and women who have served the nation during times of war and peace. The history of battle streamers dates back to the 1830s to the custom of inscribing “battle honors” on Regular Army colors. During the early months of the Civil War, following action at the Battle of Wilson’s Creek near Springfield, Mo., Major General John C. Frémont commended troops from Iowa, Kansas, and Missouri for their efforts and ordered the word “Springfield” to be emblazoned on their unit colors. The following year, the War Department authorized that all regiments were permitted to have the names of battles in which they had shown particular skill or bravery inscribed on their national colors. The tradition carried on throughout the century, with certain restrictions and specifications developed over time. On August 18, 1919, owing in large part to the growing number of battles identified, the practice of listing campaigns instead of specific battles was adopted. On October 19 of the same year the first official list of campaigns, noting seventy-six unique campaigns, was issued. In June 1920, streamers were introduced with campaign names, to address a growing concern that the flags looked too cluttered. When the Army adopted its official flag in 1956, 145 streamers were prescribed to hang from it. As the Army continued to engage in different conflicts around the world, the number of streamers has grown to recognize the new campaigns. Because the streamers themselves serve as historical reminders of past battles fought, they will be a recurring feature throughout the Museum—reminding visitors of the breadth of the Army’s storied history. Located in the Museum Lobby, the Wall of Honor, sponsored by General Dynamics, will commemorate the eleven wars and 190 campaigns by listing each campaign, with its corresponding streamer, in historical order. 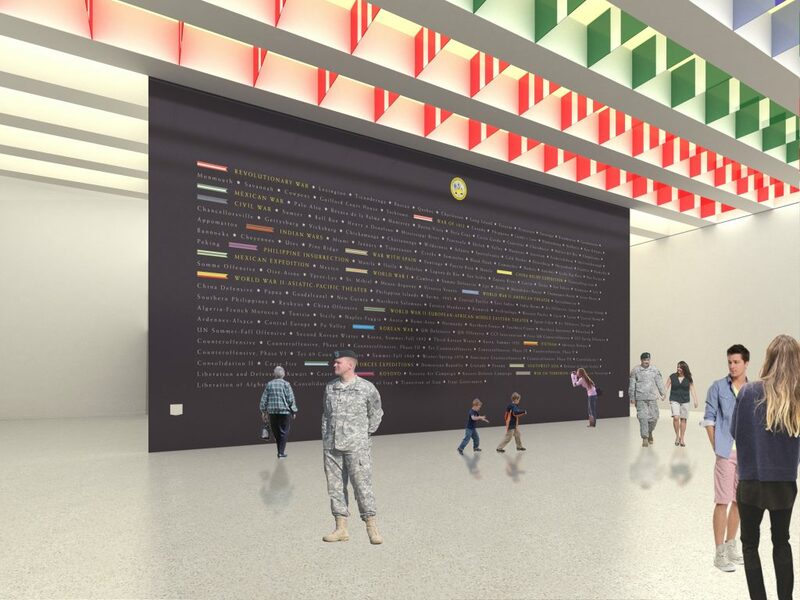 The Wall of Honor will give visitors a visual understanding of the vastness of the Army’s efforts throughout American history. Visitors will also see beautiful renditions of campaign streamers commemorating the Army’s actions proudly displayed in the ceiling of the Lobby. These colorful glass pieces are sponsored by The 1814 Society. Each entrance to the Fighting for the Nation Galleries will feature campaign streamers that relate to the history displayed within the respective gallery. Finally, in the Army Concourse, one of the way-finding interactives will feature a program called “Army 101,” which will orient visitors to the essential information necessary to understand the U.S. Army— including basic histories of battles and campaigns associated with Army campaign streamers. The campaign streamers featured throughout the Museum will be a colorful reminder of the many times the Army’s Soldiers have showed their courage and resilience in the defense of the nation and its ideals.